Earlier this month I popped into AGNO Grill (click to read Philly Mag review). This hip minimalist eatery formerly where El Fuego resided (2104 Chestnut Street) means “pure” in Greek. AGNO offers a fresh new approach to Mediterranean cuisine - meaning everything is super healthy, vegan friendly, organic, nutritious and 100% gluten-free. The co-owner of Agno, Kriti Sehgal is also behind the good for you fast food market & juice bar Pure Fare (119 South 21st Street). 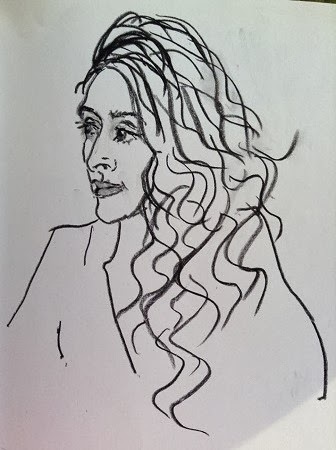 Artist/Draw-tographer Diane Roka recently captured Kriti for her series on Creative People in Their Creative Spaces. I'll have to stop back for the complete AGNO Grill experience of choosing a base, protein, topping and sauce. I came to cover the fundraiser for The Agatston Urban Nutrition Initiative - (UNI) is a program of the Netter Center for Community Partnerships at the University of Pennsylvania that engages, educates and empowers youth, university students, and community members to promote healthy lifestyles and build a just and sustainable food system. All proceeds from the night went to UNI's Community Farm and Food Resource Center and Youth Development Program, which promotes food sovereignty in West Philadelphia. Both programs are in partnership with Bartram’s Garden, the Pennsylvania Horticultural Society (PHS), and the City of Philadelphia’s Department of Parks and Recreation. The event fit right into Tinsel & Tine's theme of film and food as during the evening a short documentary was projected against AGNO's bare wall, the doc expounded on the positive impact of introducing kids to locally grown, fresh and nutritious food options.